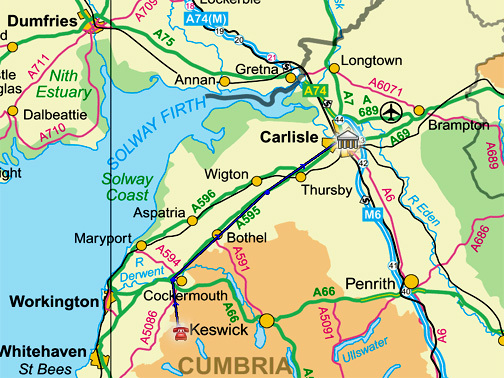 " The History Society Autumn Trip to Carlisle "
Date & start time: Wednesday 1st November 2017, 10.30 am. 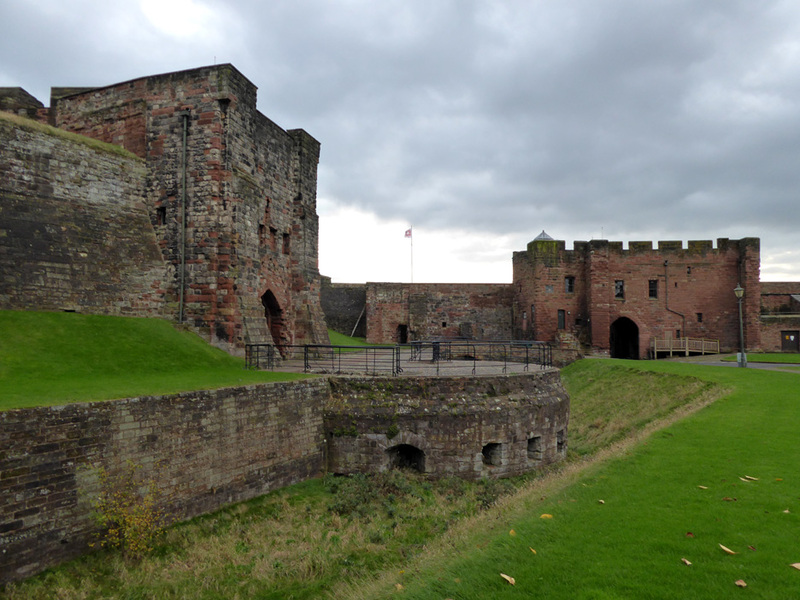 Location of Start : Carlisle Castle, Cumbria, Uk. ( NY 395 567). 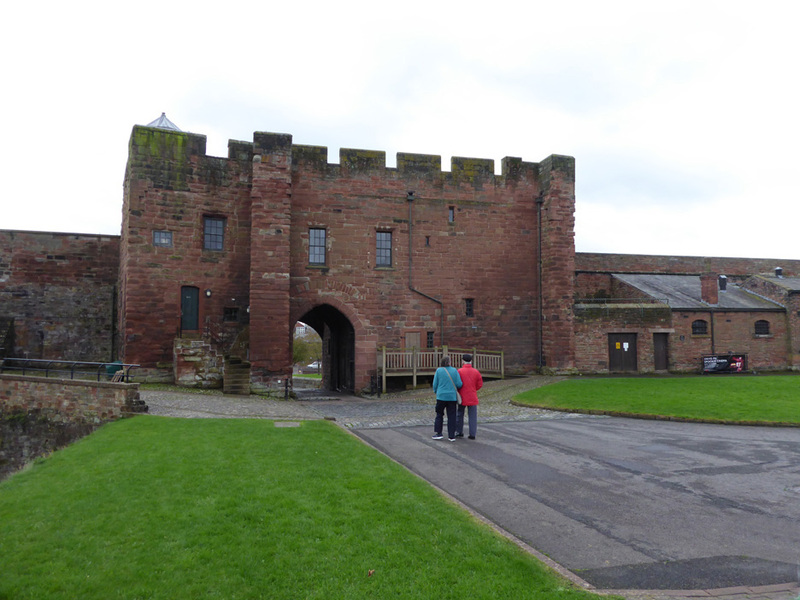 Places visited : Carlisle Castle, The Cathedral and the Guildhall Museum. 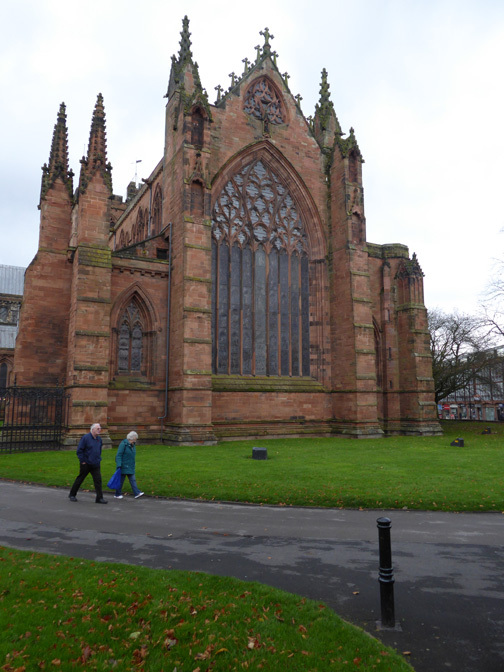 Walk details : Drove to Carlisle and then strolled about the city centre. Highest point : Delving into the history of the place. 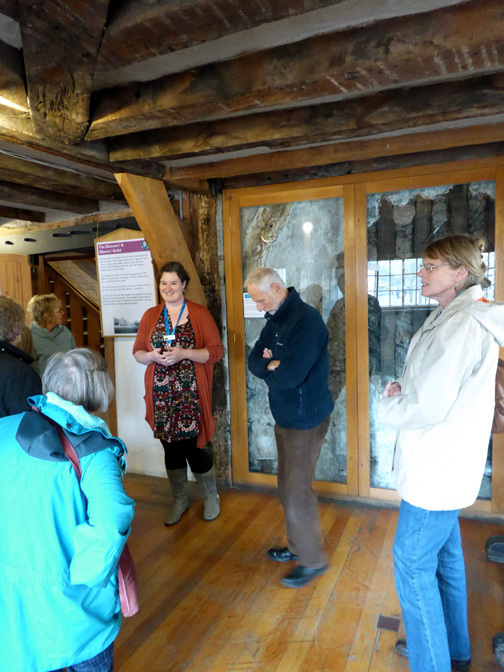 Walked with : Myself and fifteen members of the History Society. Weather : Overcast but dry. 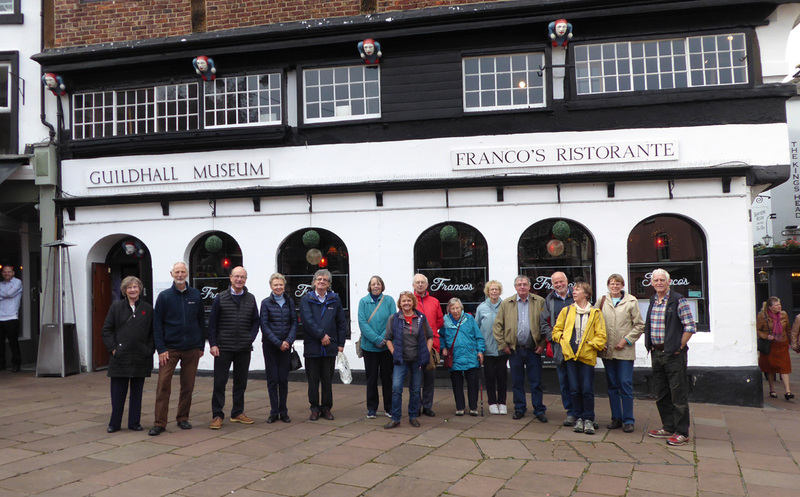 An invitation to join the Lorton and Derwent Fells Local History Society on a visit to the city of Carlisle. 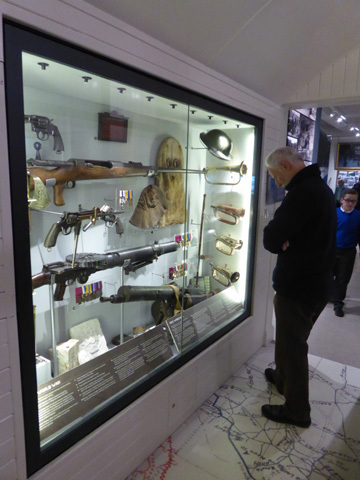 On the agenda, a visit to the Museum of Military Life inside the castle. 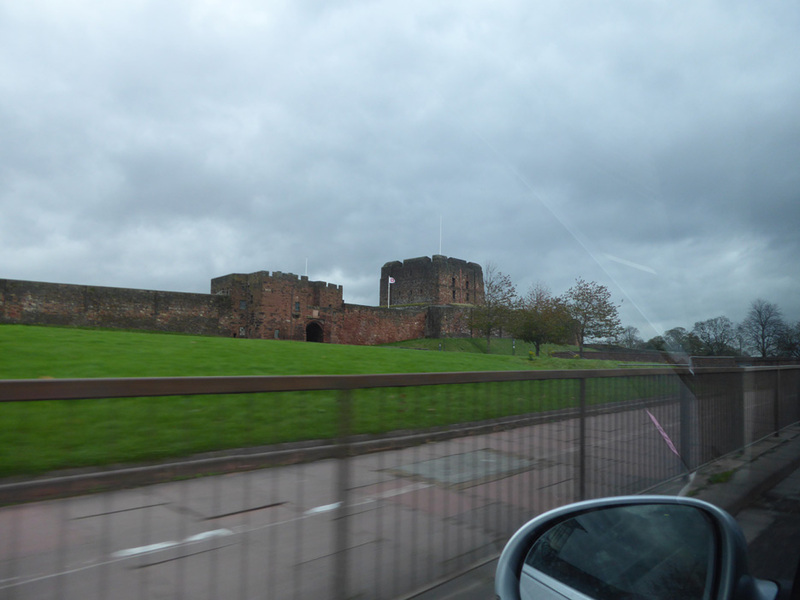 Carlisle Castle from the dual carriageway through the centre of Carlisle. to discover what lay inside. Today was a first for me. of continuous use by the English military. the most besieged town in Britain. We have permission to drive in and park inside. 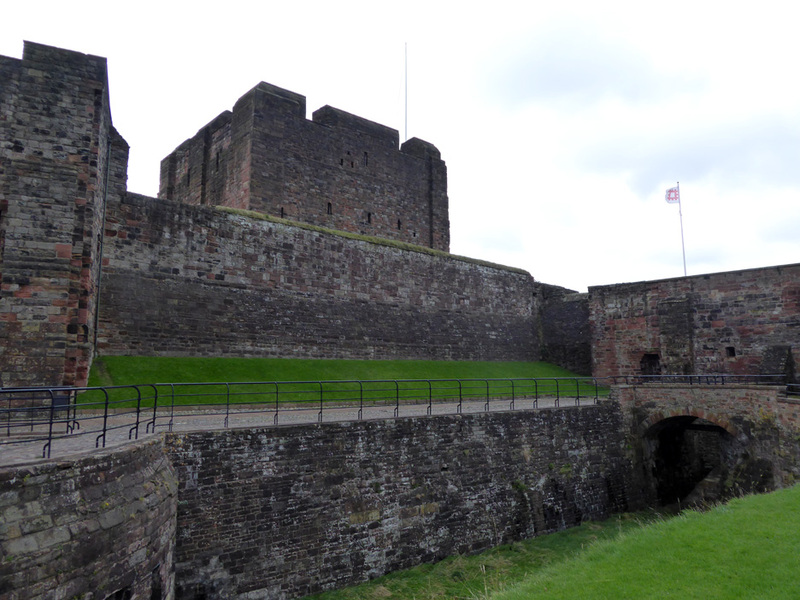 The central keep, the most secure part of the old castle, even has its own internal moat. Low level gun emplacements to stop invaders crossing the dry moat. The oldest parts of the castle date from about 1092 AD. 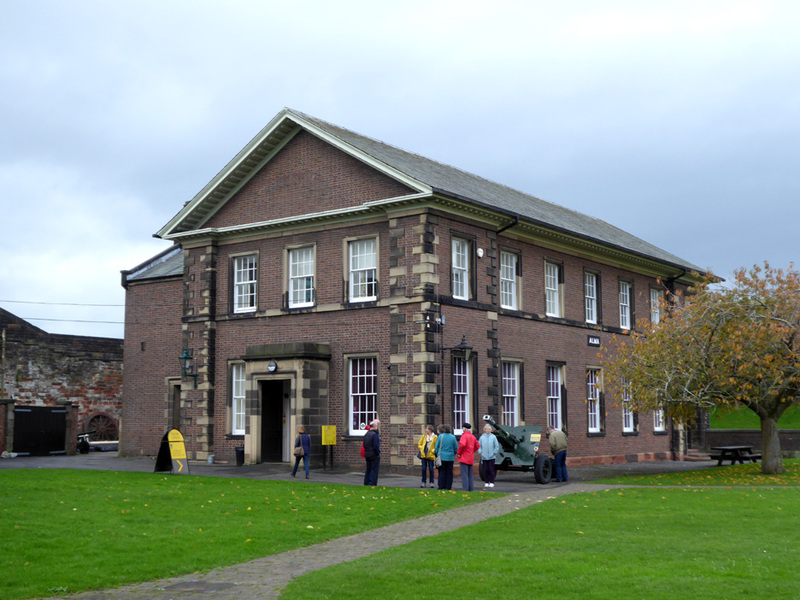 Inside the grounds are several Regency-style Barracks buildings dating back to the 1870's. for feeding and entertaining the troops based here in the castle. 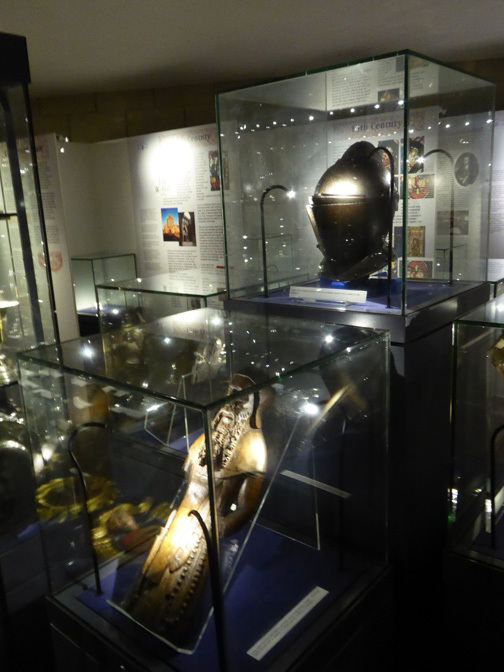 Until a few years ago the exhibition was located in the Keep itself. Now in this new home they have been given space to expand. 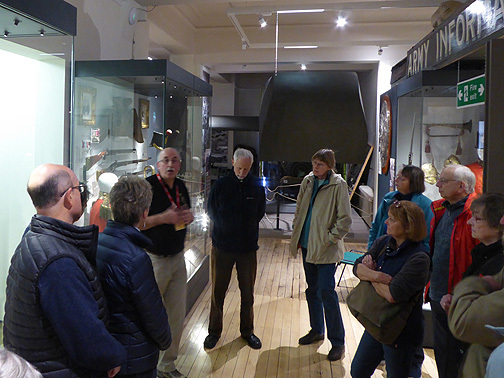 Today Stuart, the Curator (with the red lanyard) is giving us a guided tour. He outlines the theme of the exhibition . . . that is the " Story of Human Endeavour ". 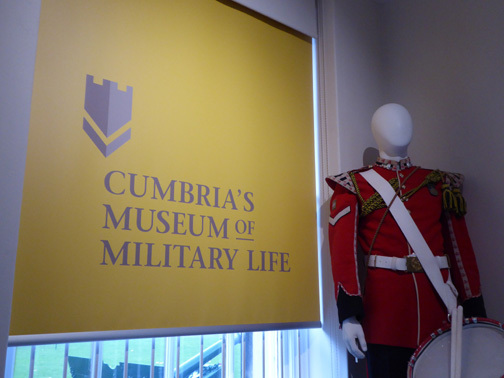 It is the story of the local people and the various Cumberland and Westmorland Regiments over the last 300 years. 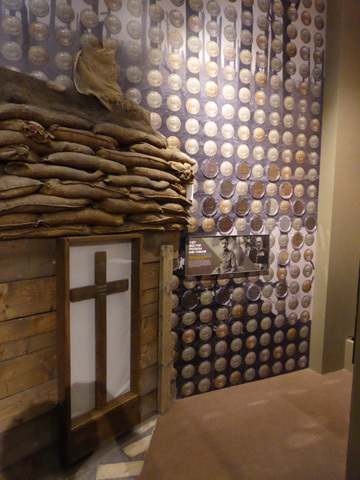 The exhibition is beautifully presented . . .
. . . and one can follow the course of history through the displays. 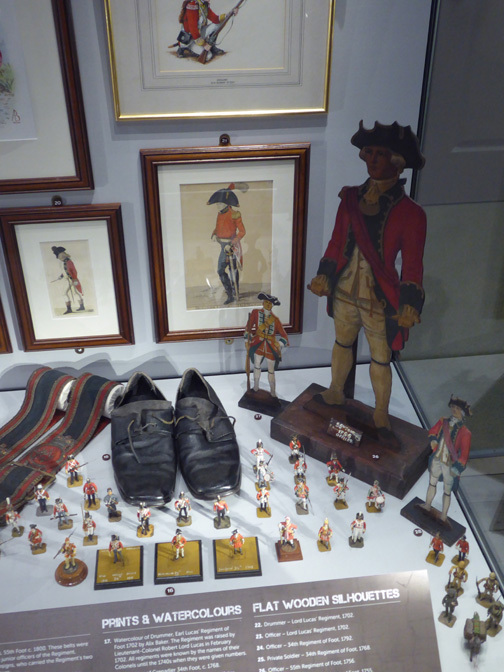 Too much to describe here so you must go and see for yourself if you can, but the cabinet above includes shoes provided to early soldiers. making them easier to manufacture and easy to match up pairs but more uncomfortable to wear! Still it was better than no shoes. 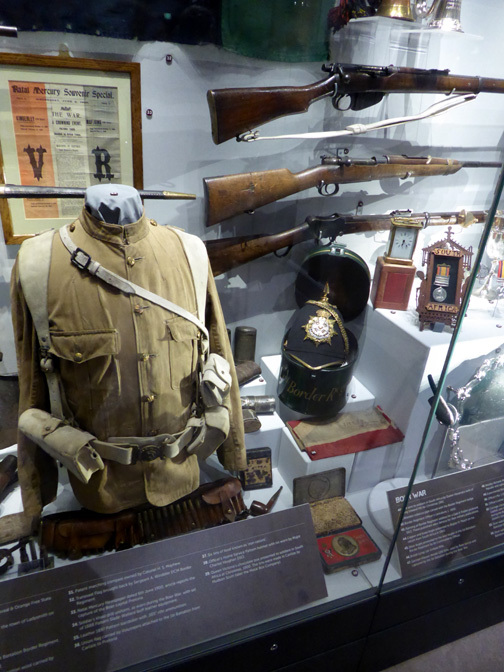 A cabinet about the Boer War in South Africa . . . during Victorian times. 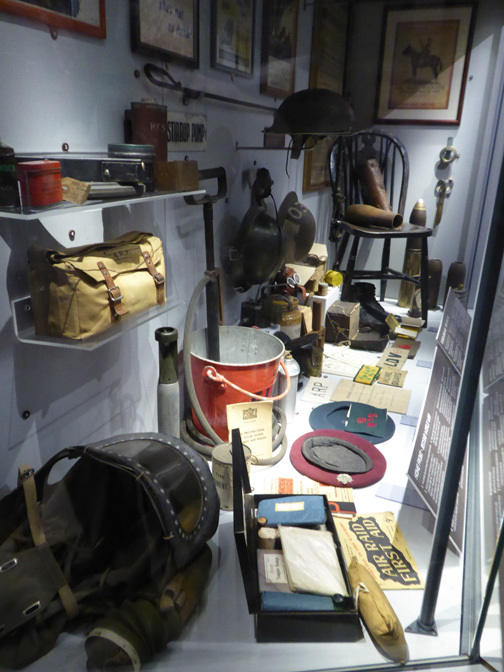 Here the Second World War, 1939 to 1945.
and presented by the Queen to each person serving on the battlefield. The red and green berets in the second display are some of the many thousands made by Kangol Ltd. They continue to make hats through to the present day. 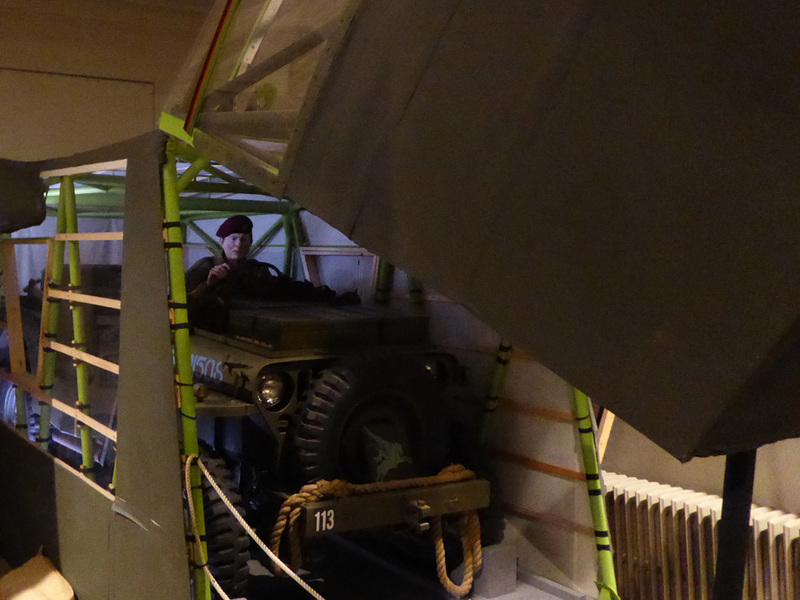 One exhibit was a WWII army jeep shown within the belly of an actual battlefield glider. 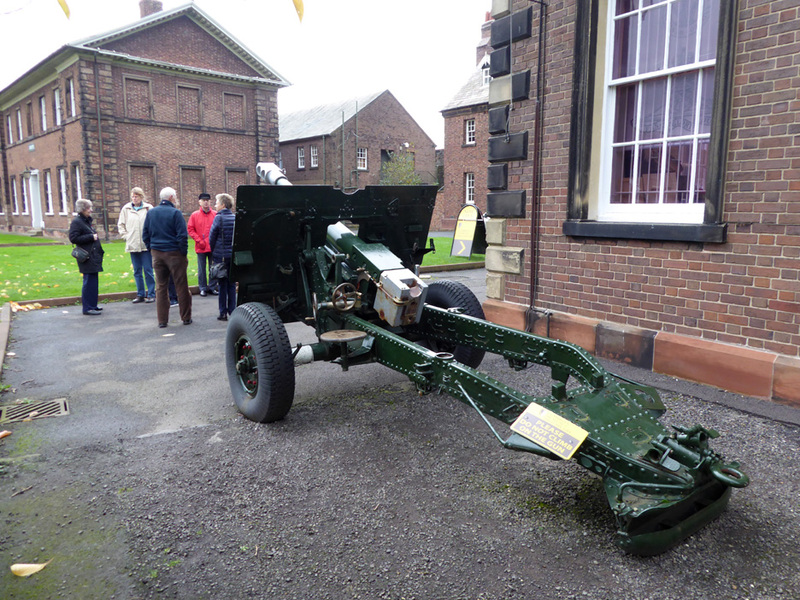 A large part of the frame of the glider was found on a Cumbrian farm and has been restored and displayed at the back of the museum. 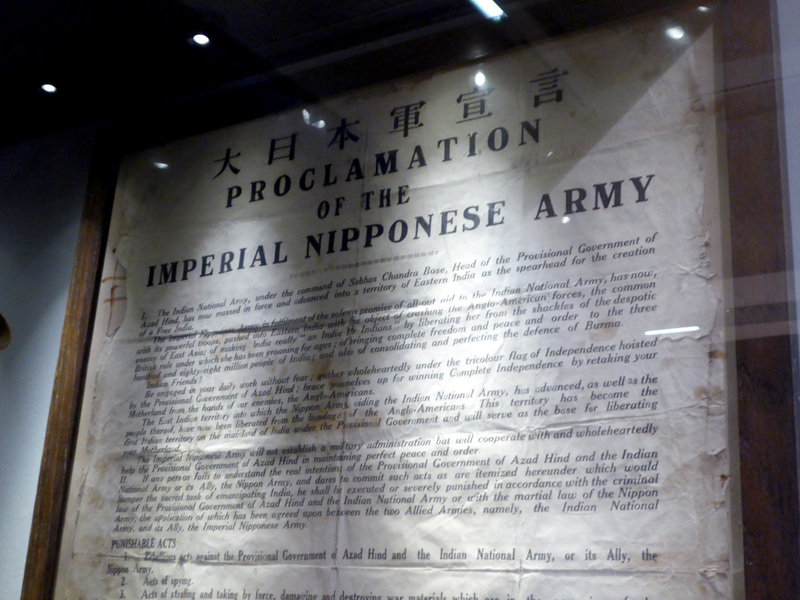 They supported the 'provisional government' of Azad Hind and the Indian National Army. After a brutal military campaign they failed . . . but India would achieve independence by agreement in 1947 anyway. 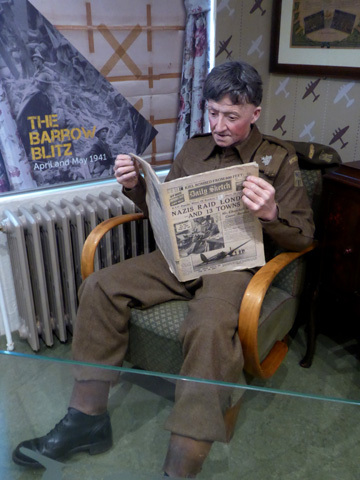 Home Forces and the Barrow Blitz 1941. 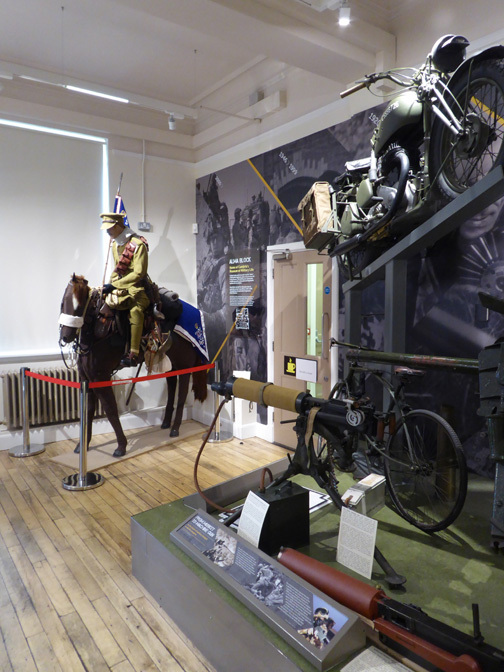 Military hardware, mementos and medals. The sadness of lost lives . . . and military crosses. we assembled outside in order to walk into town for lunch. 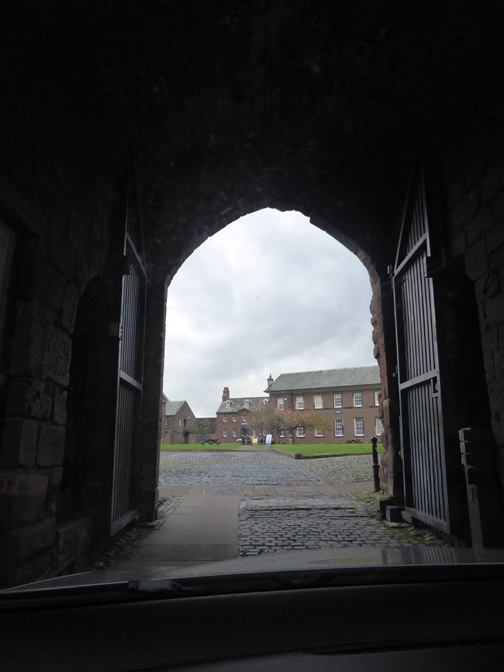 A short walk across the Castle grounds and back out through the Gate House. 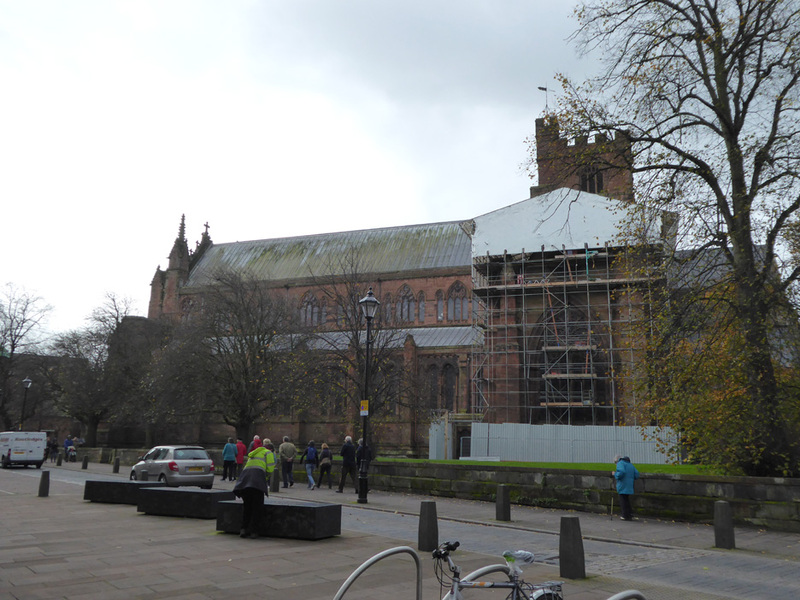 Carlisle Cathedral is undergoing repairs to the north wing but is still open for religious services and for visitors. 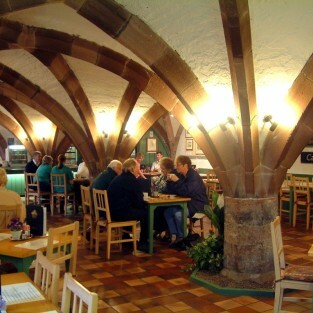 and enjoyed lunch in the vaulted rooms of the old Fratry. 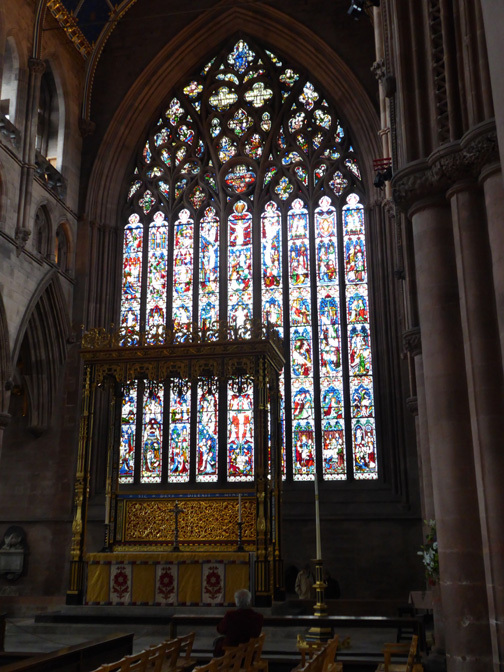 The grand 14th Century East window from outside . . .
. . . and the same window from inside the Cathedral. After lunch we had a little time to spare so several of us decided to visit the Cathedral itself and walk around the building. 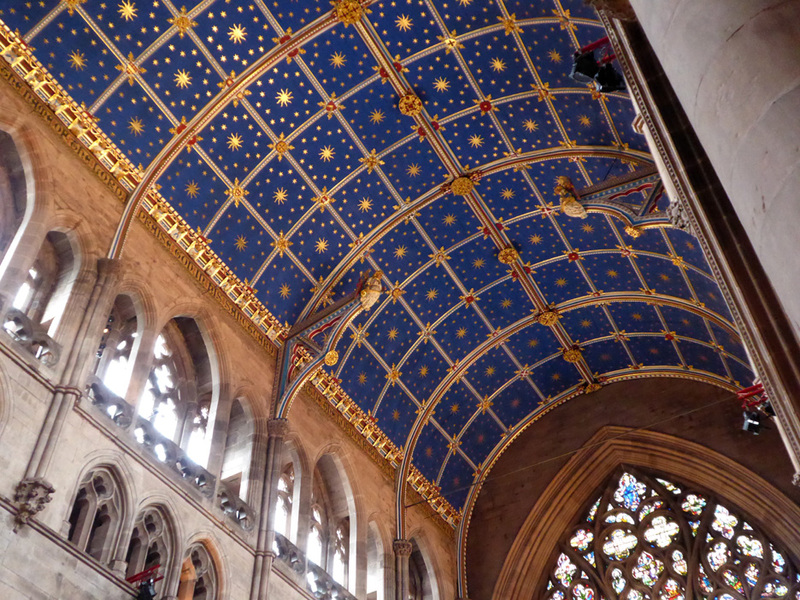 Above us was a stunning blue vaulted roof. 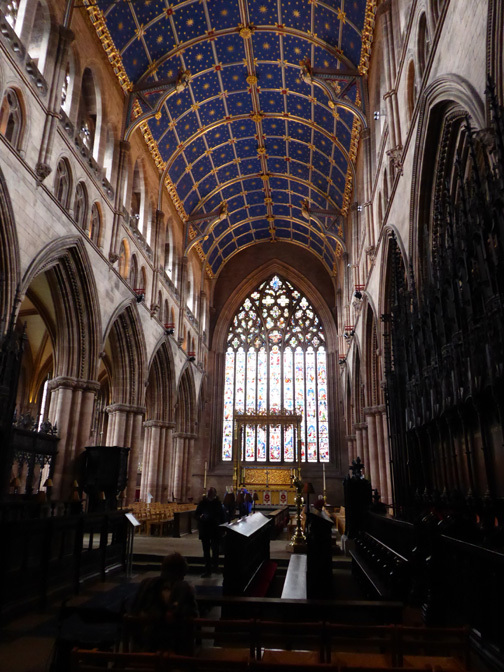 The Choir Stalls, where daily worship has been held for 900 years. 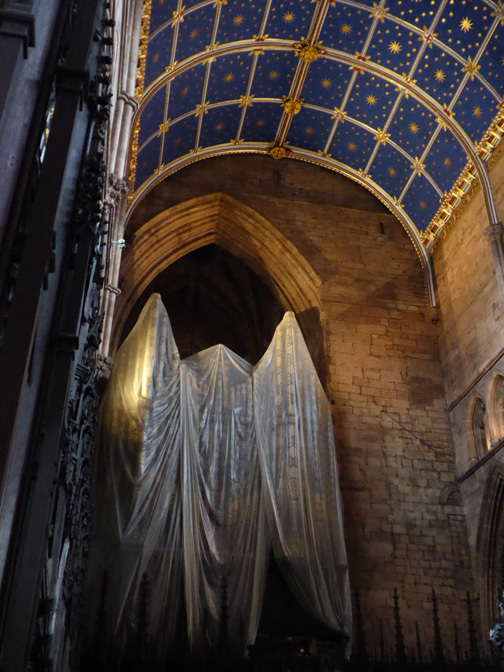 The organ is protected from the dust of the current building work. 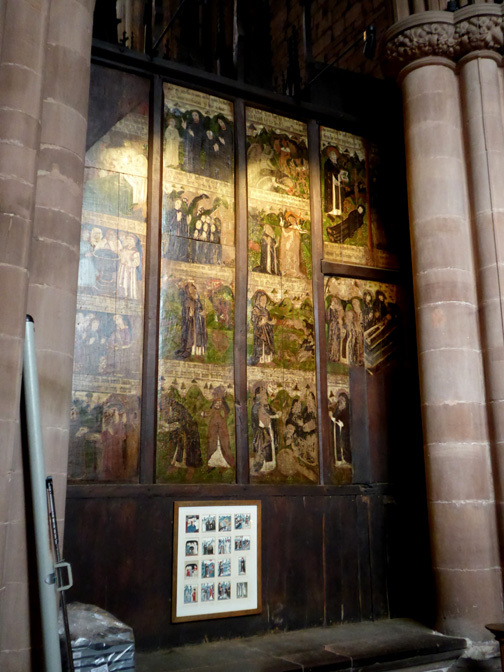 The paintings on the back of the stalls date back to the 15th Century . . .
. . . depicting the lives of the Saints and the Twelve Apostles. 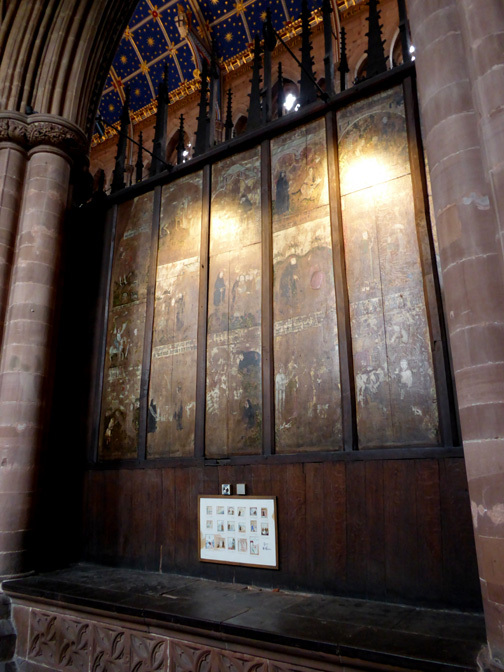 One tells the story of Saint Cuthbert . . . who ended his days on the Holy Island of Lindisfarne in Northumberland. are stored for safe keeping. in these specially built rooms in 1990. 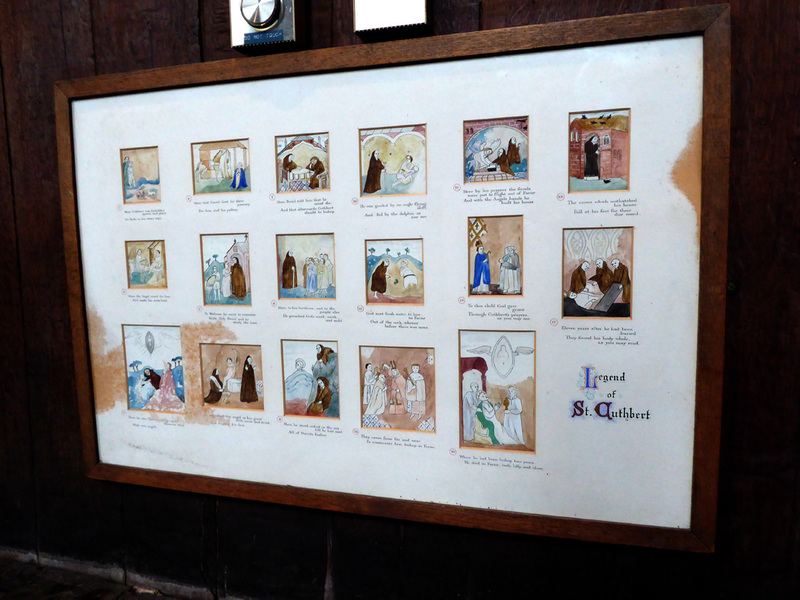 The century-by-century story boards behind . 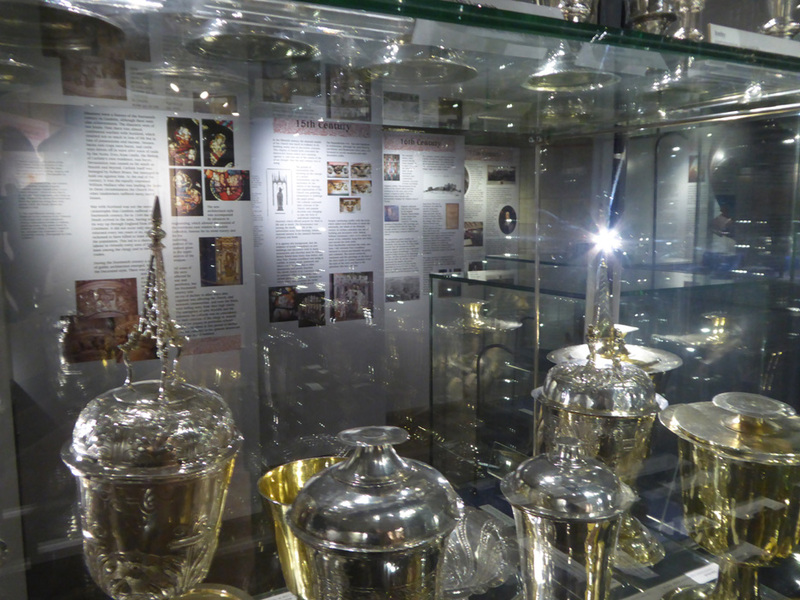 . . seen through the glass cabinets of the Treasury. 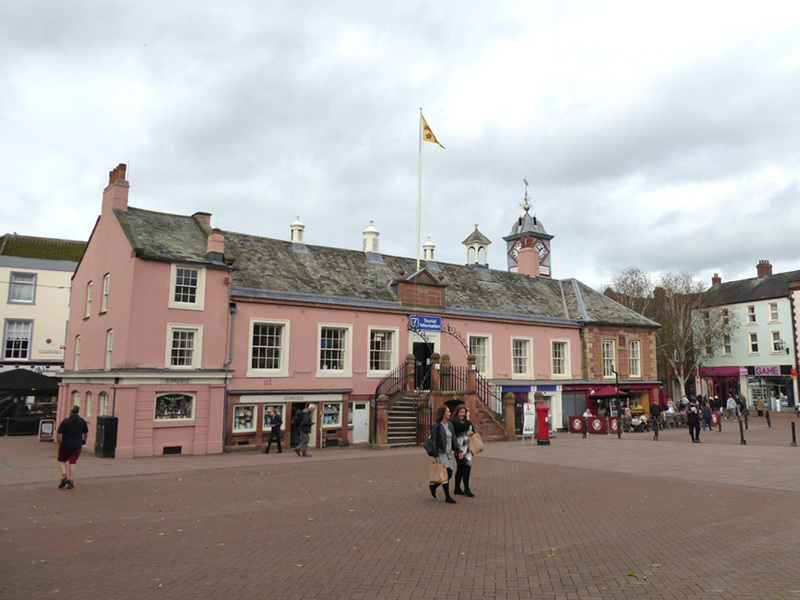 After our lunchtime explorations we all met up again in the central square of Carlisle. 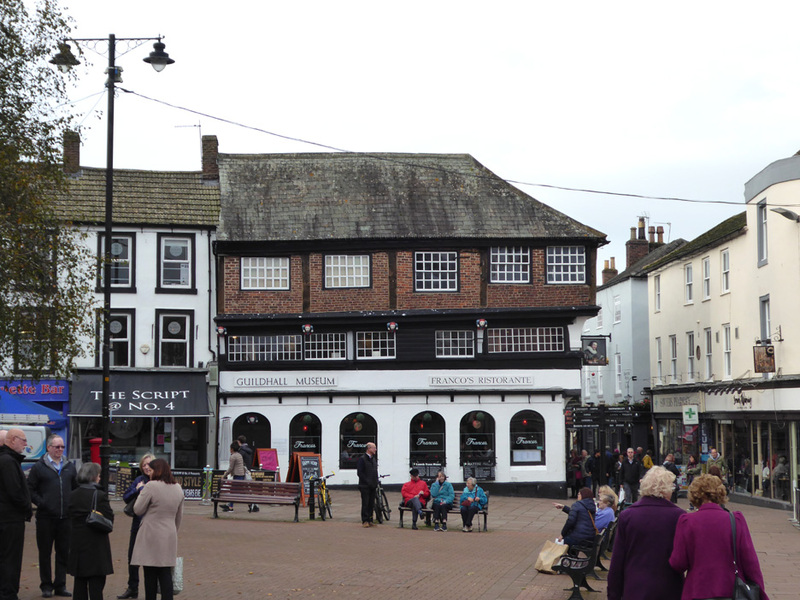 The Tourist Information Centre occupies the building which was originally constructed as the Town Hall in 1717. 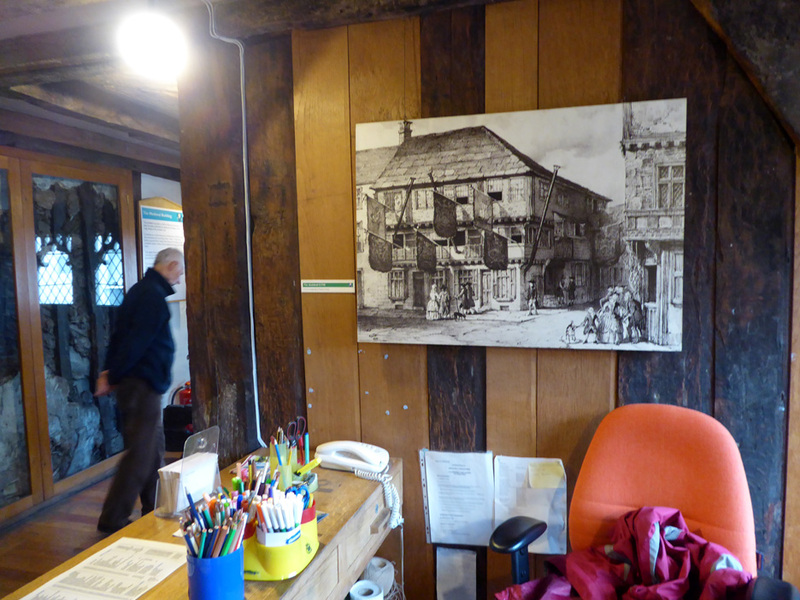 However we had planned a visit to an even older building just around the corner. I think there's one person missing somewhere . . . I'm sure we were sixteen before lunch ? and one of the four oldest buildings in the City. 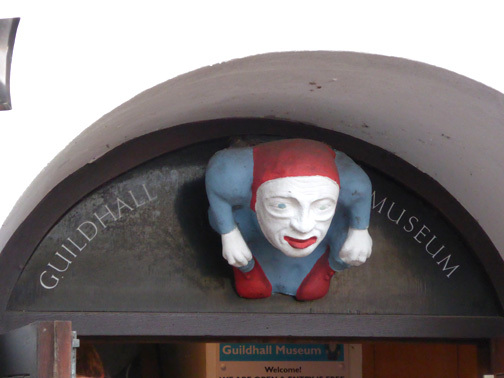 One of the 'Jesters' that adorn the building. was placed on a building in Swansea for malicious reasons. These figurines seem a lot more benign. by another expert, a lady guide this time. and the variety of uses during its history. or Societies of the city. at significant times during the year. 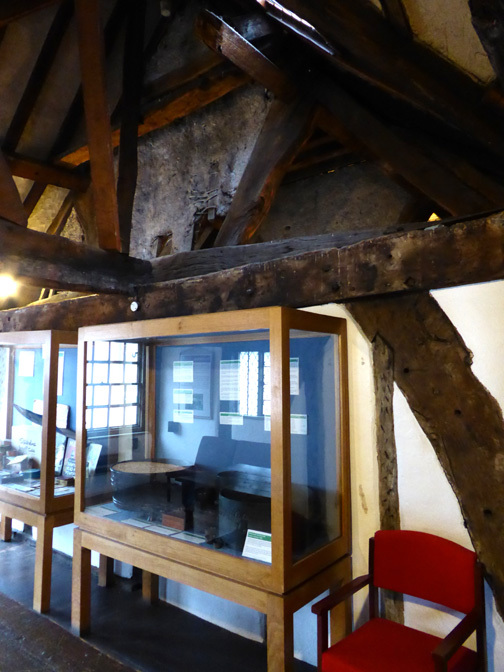 The building was innovative for its day with strong oak beams and "wattle and daub" infill. The fire proof nature of the structure served it well during several disastrous fires in the city during the times of the border disturbances. 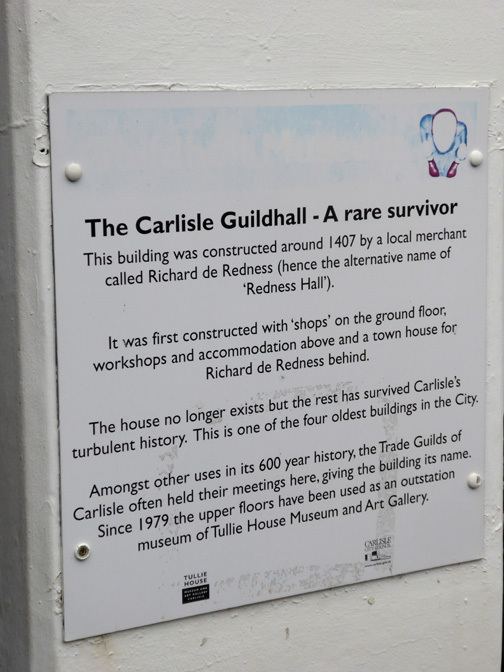 On high days and holidays the Guilds used to hang their Trade Banners outside from the windows. 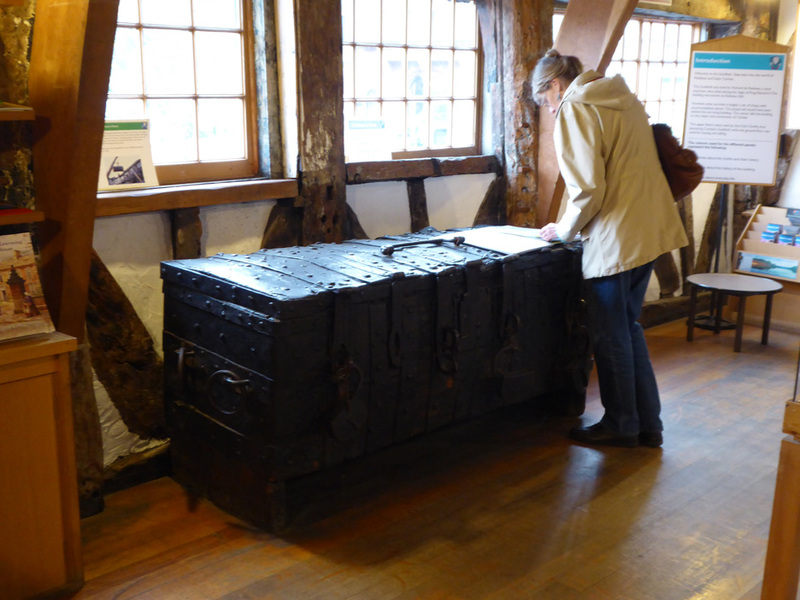 The City Chest used to hold the valuables that belonged to the Mayor and Council. 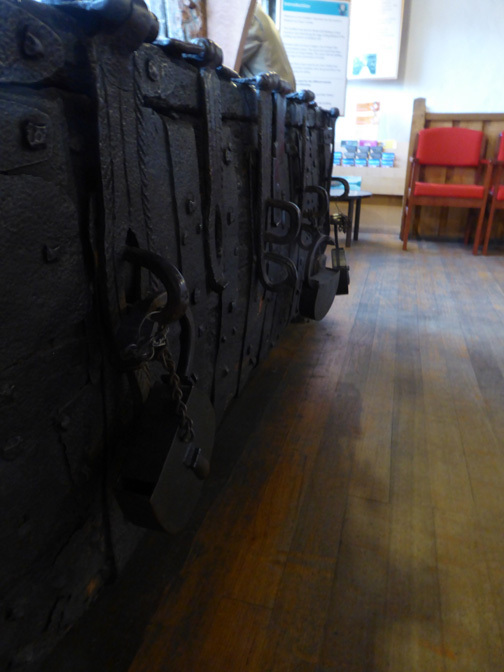 There are four clasps and four locks, each different, so that it needed all four key holders present to open the sturdy oak box. 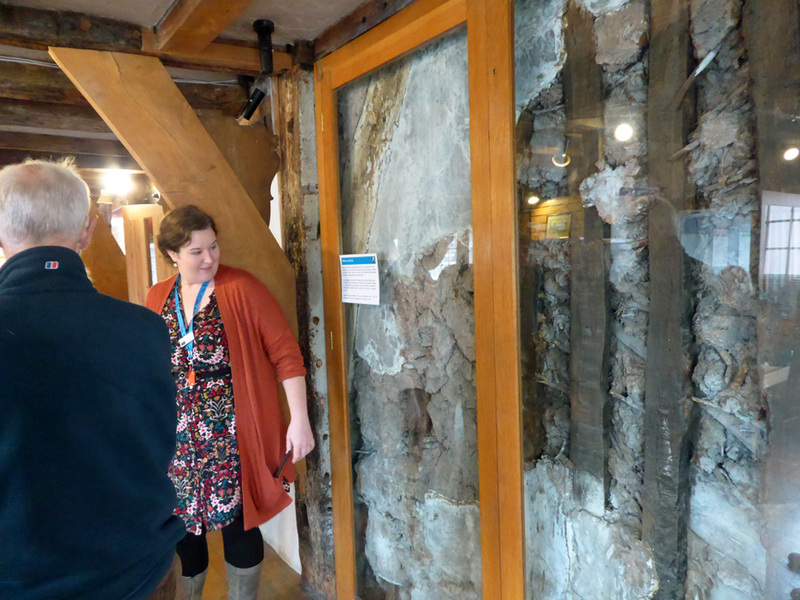 Inside was found a manuscript dating back to the times of the Guilds and outlining the laws of the city. Three of the four great locks. Old standard 'weights and measures' used by the council. a different Guild or trade. 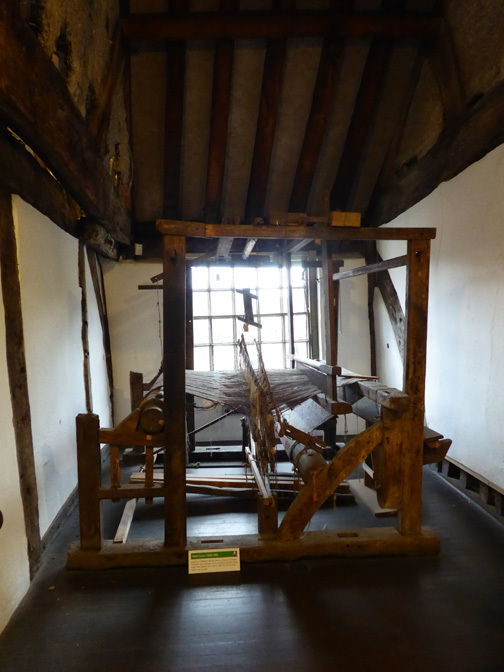 and now displays a very old hand loom. 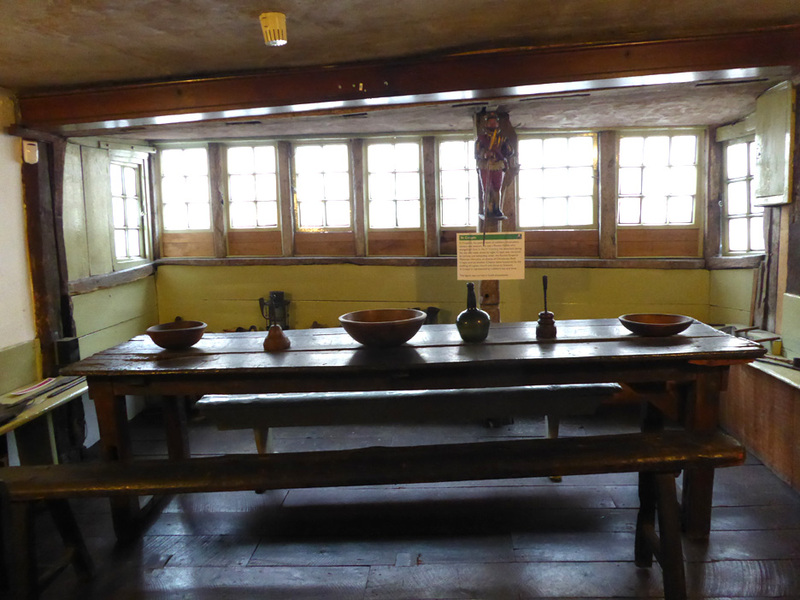 but just showed the idea that the rooms were used for wining and dining as well as discussing and practicing their trade. 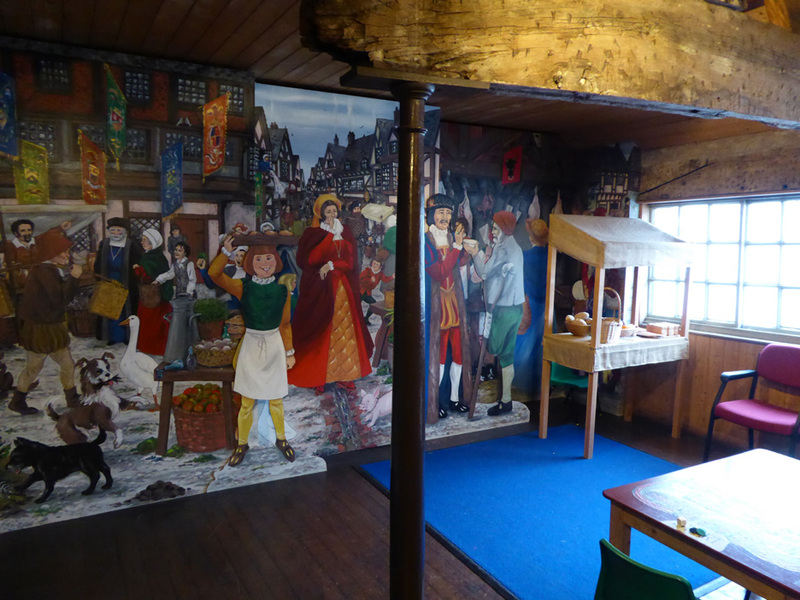 A modern mural depicting the Guildhall in its heyday. and so the politics of the time were important topics of conversation. 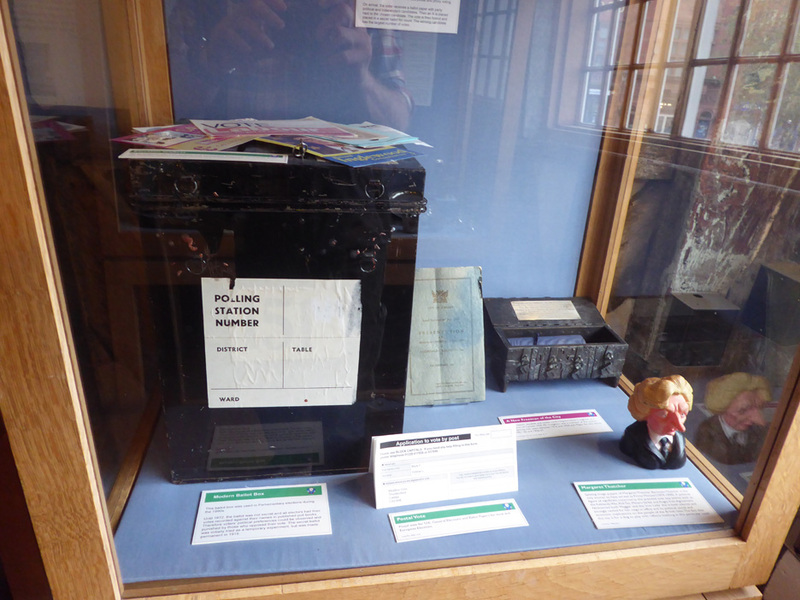 This display cabinet hints at the more modern aspects of voting in local and national politics. 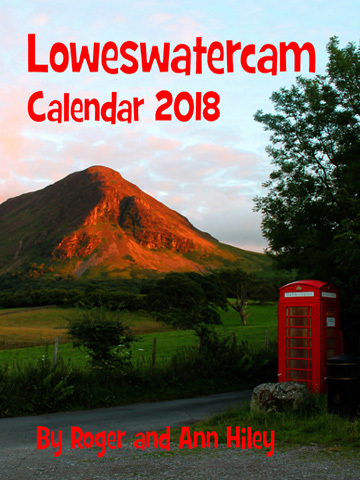 our visit to Carlisle was at an end and we returned home to Loweswater. Thanks to everyone who organised and contributed to our day in Carlisle. This site best viewed with . 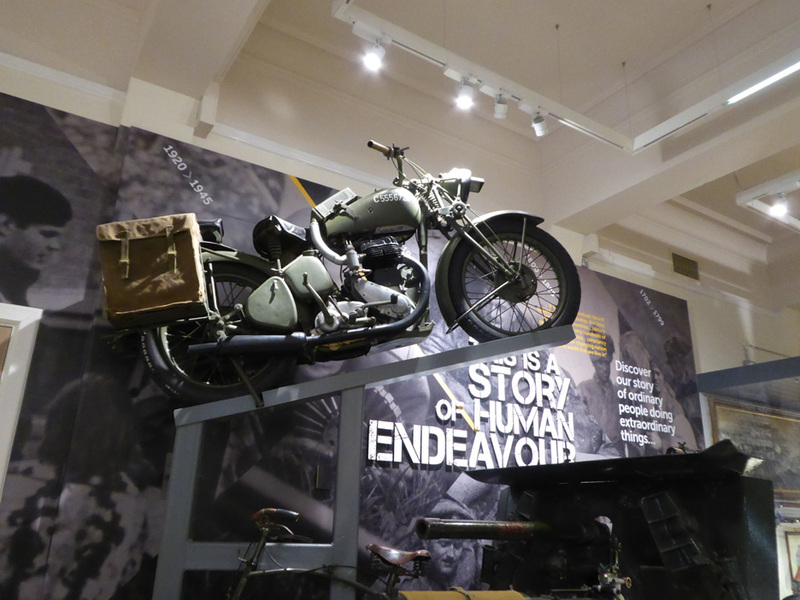 . . a guide to fill in the history and the context of the exhibits. Now on sale . . .
and your favourite mountain dogs. the Air Ambulance and local Mountain Rescue. 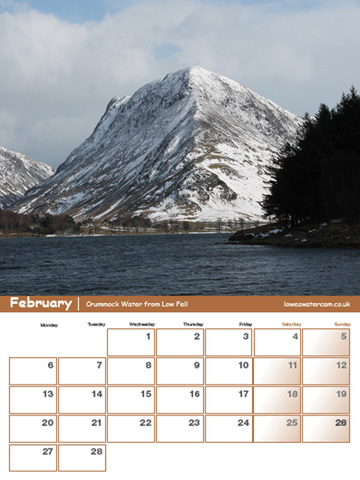 Click here to see the full details and to order your copy.